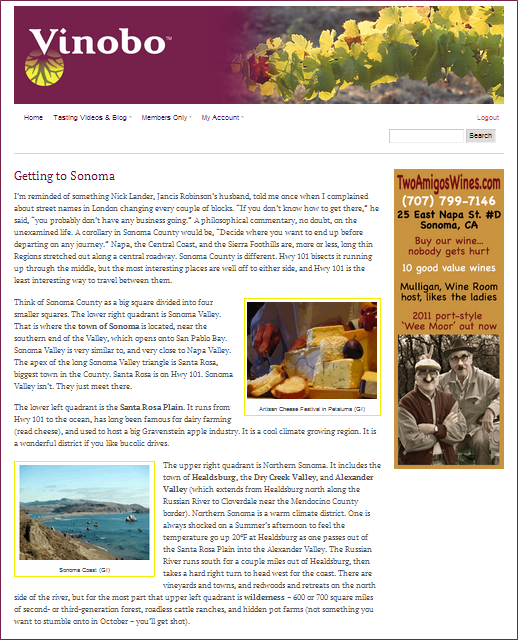 Any Walking Wine Tour in Healdsburg is bound to be more extensive than we suggest for most cities elsewhere. There are some 30 Tasting Rooms in Healdsburg. Several, such as Stephens & Walker or Pezzi-King make excellent wines which deserve attention. We suggest others, but without easily defensible reasons. Murphy-Goode is an example of winery from which I’ve enjoyed many wines over the years. I fail to suggest them here for no better reason than they feel like comfortable old shoes to me. Places like Topel and Selby are less established, but also show good potential to break out and make some noise. We suggest others mostly based on personal idiosyncrasies. Wineries marked in green are open to the public. Wineries marked in red require appointments. Bullet point suggestions are drive-by viewing and/or optional stops. Wonderful Alexander Valley producer of top quality old-vine Zinfandels. On Grove St east of the Square about half a mile. I’d see them on my way into town. Long track record of quality with Pinot Noir and Chardonnay. Emily’s Cuvee is especially fine. PN, CH, and Rhônes. Note in particular the Kemp Ranch vs. Kick Ranch terroir comparison of Syrah. Artistic wines reasonably priced. Australian tech money making about 10K css/yr of many different wines. Never know what’s on offer at the Tasting Room, but they are elegant and generous. They also seem to routinely win lots of competitions. Iconic grower / vyd mgr from the Russian River with grapes for numerous top Pinot Noirs to his credit. High-end winemaking advice. All three are part of a production ghetto in the old Roma facility on the banks of the Russian River at the intersection of Front and Hudson Sts. They are loosely known as the Front St Wineries. Some of them, in particular these three, are pretty damn good winemakers. They are a half mile walk from the Square. And you really want to call for an appointment. So I’d be inclined to see them Sunday midday. Healdsburg is one of the wine capitols of California. It corresponds to St. Helena in Napa Valley for several reasons. Both were sleepy little towns (less than 10,000 people) with modest residential bungalows for about 125 years. Then, almost overnight, they became the focus of wealthy refugees from the Big City, and began moving up-scale very rapidly. Expensive restaurants, hotels, and shops became much more widespread as the tourist trade became larger and more international. Julio Gallo’s grandchildren moved into Dry Creek Valley nearby Healdsburg, and Jean-Charles Boisset opened a Tasting Room on the Square (called Terroir) which even showed off some of his family’s famous Grand Cru and Premier Cru properties in Burgundy. A restaurant called Cyrus opened in Healdsburg which even got two stars from famously franco-centric publisher Michelin. Why, local vintner Jess Jackson even won the Preakness Stakes horse race twice (2007 with Curlin; 2009 with Rachel Alexandra, a filly no less). All this cosmopolitan attention threatened to overshadow Healdsburg’s homegrown efforts, such as the Raven Performing Arts Center and their humbly eclectic restaurant Ravenous. Only time will tell how sustainable this carriage trade proves to be. As of 2013 Cyrus had closed, and the Boisset Tasting Room was moving to their winery property at DeLoach Vyds. Four disparate wine growing districts merge in Healdsburg, as do a bewildering number of US AVAs. The areas south of the town and west to the coast are mostly cool-climate, low lying hills with lots of fog, and a robust studding of Redwood trees. Those Santa Rosa Plain districts have traditionally been dairy farms and Gravenstein apple orchards. Some of the dairy industry survives today making cheese, but apples are pretty much over, and Pinot Noir was crowned King years ago. The mouth of the Dry Creek Valley opens directly onto Healdsburg. Dry Creek is fabulous Zinfandel country, because the fog rarely makes it up into the valley, and the valley’s sides are nicely sloped. The Russian River arrives traveling south from Mendocino then makes an abrupt double U-turn in Alexander Valley. There is a huge temperature distinction between the Alexander Valley side of Healdsburg and the south side where the river escapes. Geyserville in Alexander Valley will often be 20ºF hotter than Windsor south of Healdsburg. That means Alexander Valley specializes in fruity Sauvignon Blanc and smooth Merlot. A fourth district would be the northwestern side of the Mayacamas Mountains. It includes Chalk Hill and Knight’s Valley where Peter Michael Winery is located. Those hills have a strong reputation for accessible cabs and robust Chardonnay. Smack in the center of this cornucopia, is it any wonder Healdsburg has such an ascendant reputation for world-class hospitality?